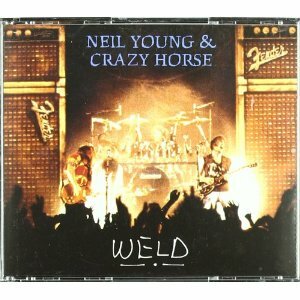 Neil Young Weld was recorded in 1991 on the tour to promote the Ragged Glory album with Crazy Horse and it rocks hard. If you’re a fan of hard rock and you’ve dismissed Neil Young as an acoustic folkie based on songs like After the Goldrush and Harvest Moon, you’re in for a big shock. There’s nothing subtle or gentle in this album. On the other hand, if you want Neil Young, the folk singer-songwriter playing live, then you’d better hurry along to Live At Massey Hall. Neil Young did some strange things in the eighties but returned to a hard rock style with Ragged Glory and continued in the tour. There’s no comprise soft and loud sides here as there is with Live Rust. This is his guitar album. Apart from the early epics Cowgirl In The Sand and Down By The River from Everybody Knows This Is Nowhere and Southern Man from After The Goldrush, this has all the tracks you could want if you wanted to ignore his folk singer past. When you’re in the right mood – angry, aggressive, worked up – but you want Neil Young rather than hard rock, heavy metal or punk, then this is the album for you. I prefer the more balanced set of Live Rust but I’ll give this set list 9/10 for containing many of the songs I’d want to hear if I saw Neil Young live. Someone must have upset Neil Young and he was determined to pay them pay. He’s angry. F*!#in’ furious in fact or at least that’s what it sounds like. Weld is probably the closest you can get to being brutally assaulted by a guitar. No wonder he became known as the “Godfather of Grunge”. This album sounds hard and dirty. It’s virtually impossible to play with the volume turned down and if you did, you’d miss out on so much of the experience. I believe the Ragged Glory and Freedom tracks are enhanced in this extended live setting. Like A Hurricane is extended by even more guitar solos. Only Cortez The Killer sounds muted to me but that might only be because it was a stand-out on Zuma and Live Rust and it feels like a slow ballad on Weld… well almost. Here are some videos of Neil Young performing live in concert with Crazy Horse in 1991. Powderfinger – I’ve no idea why this video starts with a stealth jet but it gets there. So why not 10 for performance? There’s an overwhelming amount of guitar on this album but it shows up the limitations in his soloing style when compared against the very, very best. I want to see and hear Neil Young backed by Crazy Horse, one of the greatest support bands ever. If they play like this, I expect my ears to bleed. But it will be thrilling. The sound quality for this raucous, rough, tough album is excellent and the feedback is included as a bonus. At least you don’t have to listen to the 30 minute Arc feedback album that it originally came with. My problem is that I like both sides of Neil Young – the acoustic and the electric. That to me is the real Neil Young. This has been a tough album to rate because I listen to the individual parts and I have to recognise that it’s an extraordinary noise. Loud, aggressive but also packed with melody. But I know I prefer Live Rust. And I don’t think Live Rust is the greatest live album ever so I’ve had to give myself somewhere to go in my rating system. A total score of 26/30 still makes Weld one of the best live albums ever. What Do Others Say About Weld? It hasn’t featured in any of the greatest live album lists and I’m surprised. Live Rust is a regular and I would have expected some people to have preferred this raw, all-electric explosion of sound. Reviews at Amazon are very positive. What Do You Think About Weld? Which do you prefer – Weld or Live Rust? What do you like and dislike about this album? Is Weld The Best Neil Young Live Album? I have created a readers poll to find out what popular opinion says is the best Neil Young live album. Please click the link and vote or you can see the results of other people’s votes so far. What Are The Great Hard Rock Live Albums Of All Time? I have included Weld in the nominations to find the best hard rock and heavy metal live album. It didn’t make sense to treat it as a singer songwriter best album. This entry was posted in 1990s Live Albums, Heavy Metal Live Albums, Singer Songwriter Live Albums and tagged 1990s hard rock, 1990s Songwriters, 1991 live albums, 26, heavy metal 1991, Neil Young Live Albums, SS Y by Paul Simister. Bookmark the permalink.